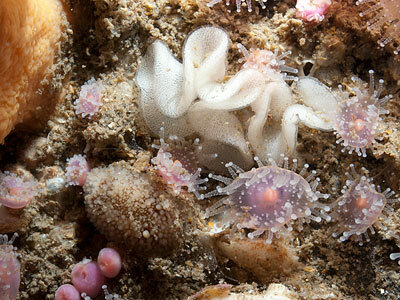 MOLLUSCA : NUDIBRANCHIA : Onchidorididae SNAILS, SLUGS, ETC. 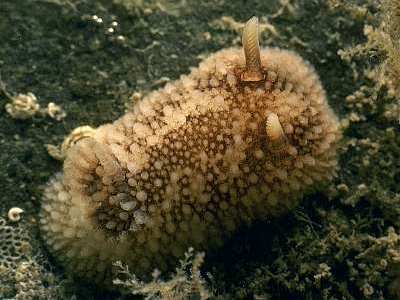 Description: This nudibranch is usually white with a brown pattern on the mantle, however immature specimens and occasional adults may be all white. The mantle bears many club shaped papillae. The rhinophores are lamellate and the numerous gills are arranged in a horseshoe. Adults may attain a length of 40mm. Habitat: This species is gregarious, and large numbers of individuals are often found feeding on barnacles on the low shore and sublittorally. The spawn is a short flat ribbon laid in a curve or concertina shape. Distribution: Found all around the British Isles and northwards into the Arctic circle and to America. It reaches the southern limit of its distribution on the French Atlantic coast. Grey animal with a brown pigment pattern and rounded tubercles. Numerous (up to 29) retractile gills in a horseshoe. Picton, B.E. & Morrow, C.C. (2016). Onchidoris bilamellata (Linnaeus, 1767). [In] Encyclopedia of Marine Life of Britain and Ireland.